I am Bob, Betty Lynn's partner and Roadie. When she holds a drumming workshop, I do the driving, set up the drums, make sure the PowerPoint is working, and then sort of disappear. As a hobby, I have taken to "antiquing" in the vicinity, looking for figurines and other pieces depicting frame drummers. Sometimes I am lucky, many times I am not, but as time passes our collection slowly grows. This blog, in the coming weeks, will share some of our finds with you. Perhaps you will share some of yours with us. 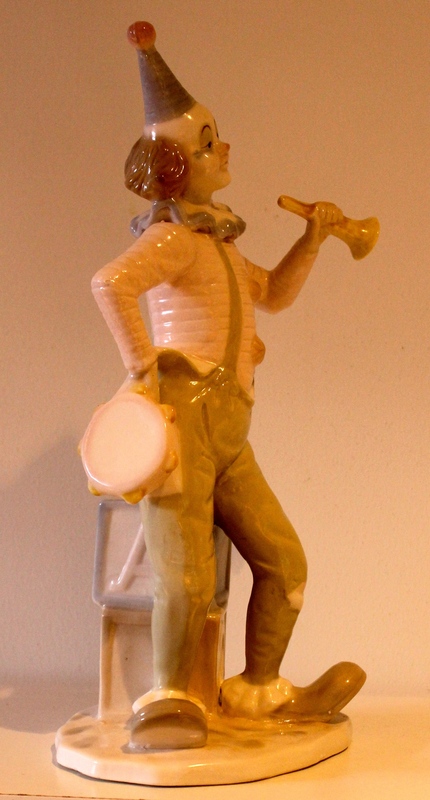 Betty Lynn and I have been on the lookout for a Victorian bronze figurine of a frame drummer. This week, on one of our Sunday visits to the Stittsville Flea Market we were able to acquire a brass rather than a bronze figurine of the type we were looking for. The piece we found is a cast brass frame drummer weighing in at nearly eleven pounds and standing 15.6 inches high. There are no foundry markings on the piece so I have no idea where it comes from. My first instinct is to say France, but the girl depicted reminds me of German bisque figurines, so I would not rule Germany out. Again, I would invite anyone who has further information to add a comment. Her hair is luxuriant and reminds me of the "big" hair so popular in the 1980s. Is He African or South Asian? 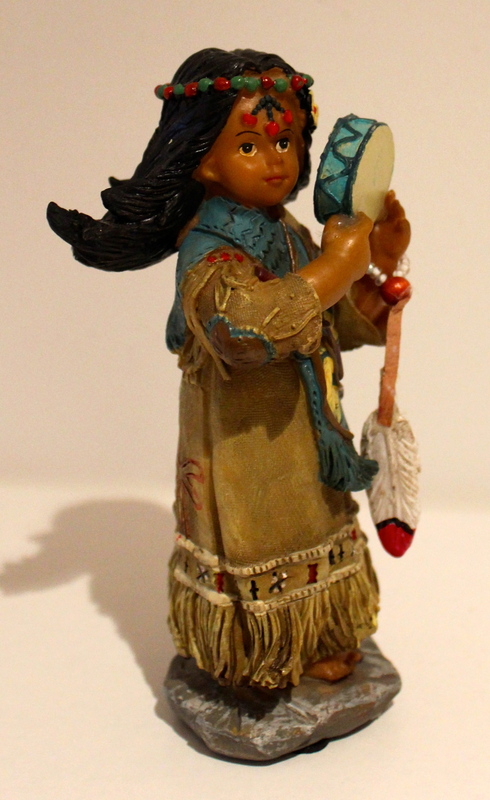 This 26 inch tall metal figurine was presented to Betty Lynn as a "Thank You" gift from her Drumming Circle at the United Church of Canada headquarters in Toronto where she worked from 2007 until 2012. Because it was a gift, we have no idea where it was found or where it comes from. Some suggest it is from Africa while others, myself included, tend to think of it as of Indian origin. Any ideas? But, no matter what, it is is still an intriguing piece because unlike so many of our frame drummers, this figure would appear to be male. The following picture will give you a better idea of his height and interesting proportions. Because of Betty Lynn's interest in frame drumming, I usually associate the tambourine with graceful angels or beautiful women, but others seem willing to hand the drum off to a variety of other players, including clowns. So far, we have collected three examples of this. While some see the clown in pancake makeup as a hilarious figure of fun, others see the clown as a sad soul, a melancholic being, longing to be understood on his or her own terms. The central figure, above, seems to fit the latter description. Betty Lynn found this sweet little figure in April 2013 when we took a drive along a country highway in Indiana which passed through one small community after another, each with its own little second-hand shop. This sad little clown is in fact a music box, as you can see by the above picture. 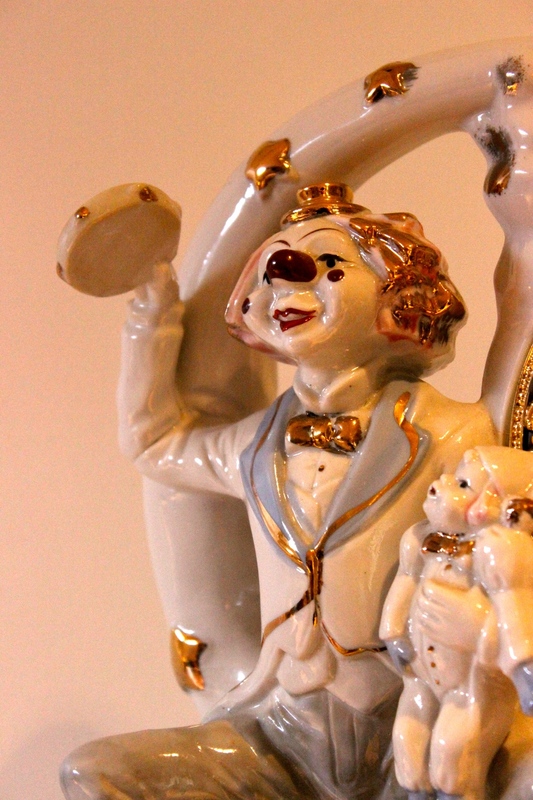 The remaining two clown figures are more in the tradition of the "any-thing-for-a-laugh" tradition of the circus. The first stands 12.5 inches high, and was probably intended as an ornament for a very upscale nursery. I found it in an Antique Mall called the Manor House, in Indianapolis in October, 2012. 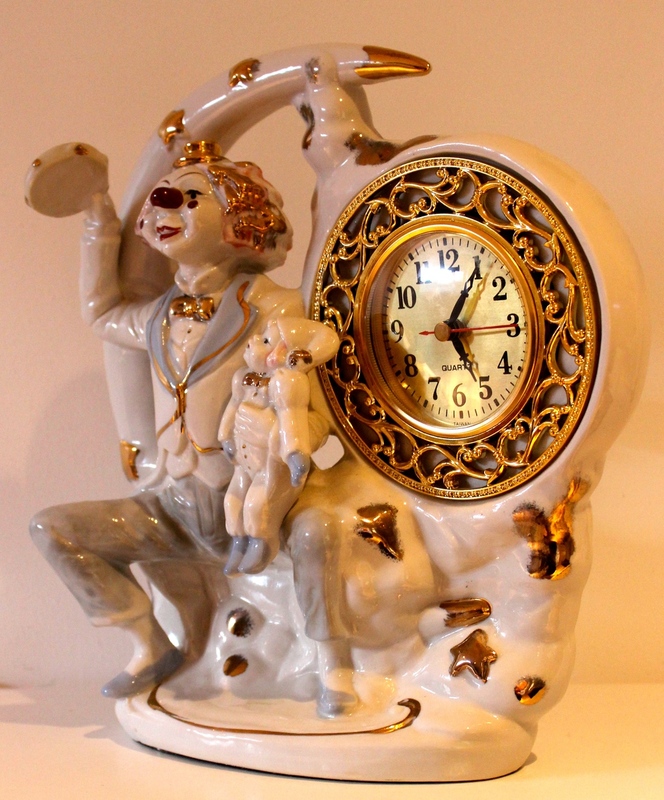 I have no idea why anyone would want to own or display the third piece: the clown clock. If it were placed in a child's bedroom, it could be the stuff of nightmares. I remember when Betty Lynn found this piece in April of 2013 in the Centerville Antique Mall in Centreville, Indiana, I was sort of hoping that she would just set it back on the shelf with a comment such as: "interesting, but we have no place to put it!" But no, she purchased it, and now it is on a self with the other two clowns in this entry. In writing up this blog, it suddenly struck me that all three of these figures were purchased in Indiana. Is there a message here? Are clowns with frame drums a "thing" around Indianapolis? Just asking. Over the years, Betty Lynn and I have collected a few Salvation Army figures featuring the tambourine, or as Salvation Army members call it, the timbrel. The history of the timbrel in The Salvation Army is an interesting one, though there are differing stories as to the origins, or at least, the identity of the first timbrellist. The best one, goes something like this. Lizzie was a cashier at a cheap little theatre near first Salvation Corps in London. She was a rough Cockney girl, and anyone who tried to sneak into the theatre free of charge would get a rough handling by Lizzie. One thing fascinated her though: the tambourine-playing troupe of 'gypsies' who performed nightly inside the theatre. When she converted and became a Soldier, the Captain, who had heard of Lizzie's accomplishments on the tambourine, asked her if she would join the drummers. Soon Londoners became accustomed to the sight of a dark, vivacious woman marching in Army processions, and playing a tambourine as if her life depended upon it. 'Tambourine Lizzie', as they called her, became an Officer and married a Scottish Captain in the Corps. According to the War Cry, New York, Lizzie played a tambourine solo at her own wedding. The use of the timbrel, whoever was first to use it, spread very quickly within the ranks of the Salvation Army. The War Cry of 7th October, 1882, noted that 1,600 timbrels had been sold in six weeks. William Goddard designed a timbrel in 1893 that was better suited to Corps band needs. The timbrel that is used today in Salvation Army Bands hasn't changed significantly since the original design by Goddard. 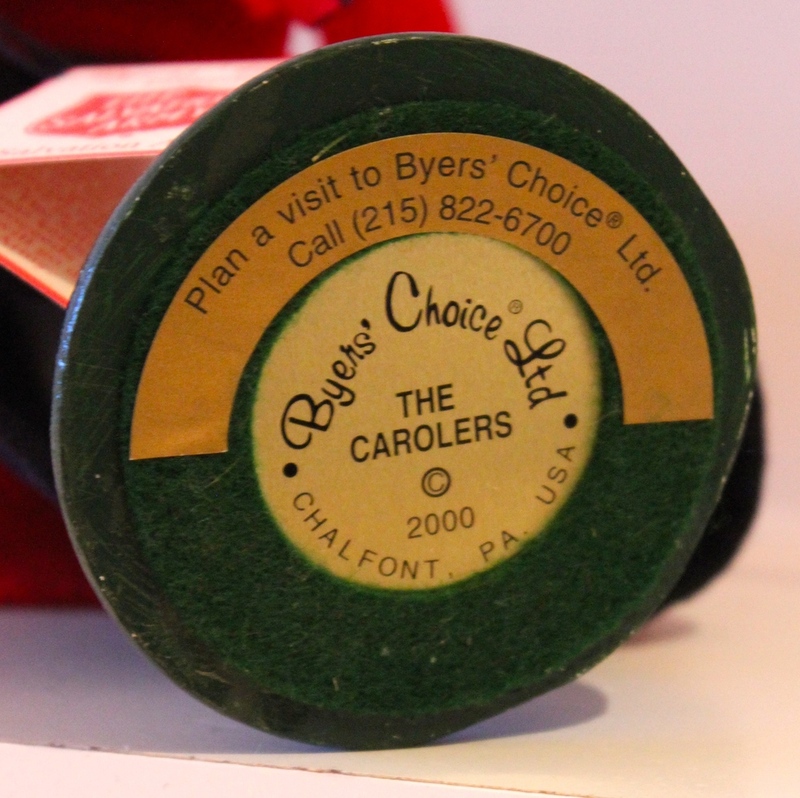 Three of our four figures are created by Byers' Choice Ltd. of Chalfont PA. The two above are Carolers from the 2000 Collection. It is interesting to note that the brunette plays with her right hand, while the blond plays with her left. The base of both invites the public to visit Byers' Choice. The taller figure is the older one, dating to the 1995 collection. Here, on the base, the public is not invited to Chalfort, PA, but can write away for a free newsletter about Byers'Choice products. The boy figure in plaster is not from Byers' Choice. He was manufactured in China, but clearly he was designed to imitate the more expensive cloth dressed American figures. Still, he plays his timbrel (note his 2 sets of jingles) with innocent delight and we are glad that he is a part of our little cluster. When we were living in Toronto, we had a favourite little Italian trattoire on Dundas Street where we would sometimes dine out on a Friday after Betty Lynn was finished work for the week. One of the reasons we particularly liked this little restaurant was the fact that over the bar area, there were a couple of plaques built in the wall featuring frame drummers. Betty Lynn always said that if the place ever went out of business, she would personally rip them out of the wall herself. This was some years ago, so I can only assume the restaurant is still in business and the plaques are still in situ. Here are some shots I took of them at the time. We always kept our eyes open for such plaques, and in April, 2013, we finally found one in Adam's Antiques Mall, Adamstown, PA. It was an eleven and a half inch square concrete wall plaque. However, we had a certain amount of difficulty in purchasing it. I spotted it hanging quite high on the mall wall. When I pointed it out, the mall operators were quite reluctant to bring it down on the basis that it belonged to an individual who never bothered to price his stuff, and as he was not there. they could not sell it. It took some doing, but I finally persuaded them to get a ladder and bring it down on the off chance this one actually was priced. No such luck! Not a clue! As we were leaving Adamstown the next morning, I pleaded with them to try and reach the owner and get a price from him, promising that we would return before leaving town. They were none too enthusiastic, but we left it at that, and sure enough, when we returned the next day we had a price, well within our price range. Here's what we found. It is not exactly the same as the ones in Toronto, but clearly it belongs to the same family of plaques. While we are on the subject of plaques, I picked up a couple of eight and a half inch painted plaster circular plaques in a small shop in Wiscasset, ME, in July of 2013. They are clearly inspired by Luca della Robbia's Singing Gallery in the Duomo of Florence. Only the first has a frame drumming putto, but I include the second plaque to complete the pair. All Fontanini figures made from polymer resin are marked. Older figures are marked on the undersides with a small spider and the words "Depose Italy". During the 1980's, Fontanini replaced the spider with the Fontanini name, the date of manufacture, and a small fountain. After completing my last blog entry, I remembered that we had acquired another grouping of polymer resin figures at the Ontario Antiques Mall in Farmington, NY, in early May, 2013. They were quite inexpensive and of the five figures, we were really only interested in the figure holding the frame drum with the very curious attached jingles. Now that I realize that they are pre-1980 Fontanini figures, I am glad that we kept the collection complete. So here they are together, four dancing damsels in a variety of ethnic costumes dancing to the beat of the drum. Which brings me to the copy-cat. The day before, we had picked up another Italian polymer frame drum player with similar jingles on her drum at the Springfield Antique Center in Ohio. We paid almost as much for her, as we paid for the five the next day! When we compare the two, there is no question that the Fontanini figure reflects superior craftsmanship, but both are charming and welcome additions to our frame drum collection. Over the years, Betty Lynn and I have collected a few Fontanini figures which now make up the little tableau pictured here. It all began with five inch "Dinah" in the blue-green dress, whom I found in a little shop in "old" Montreal. These polymer figures are made and hand-painted in Italy. Each one comes with a story card which not only tells a story about the figure, but also gives an interesting insight into life in biblical times. Dinah's story card, for instance, tells of her first participation with her drum (timbrel) as an adult in Shavout, the Festival of First Fruits. The fourth generation of the Fontanini family is still carrying on the Italian Nativity tradition. These Nativity figures are still crafted in Bagni di Lucca, a village nestled in the hills of Tuscany. This region is home to the Fontaninis, who continue to carry on the artistic legacy of their great-grandfather Emanuele Fontanini who founded the company in 1908. While in the United States on business, Betty Lynn came upon a second figure of Dinah, in a special limited edition created for the Fontanini Collectors' Club. This figure was sold to members only and production was limited to those produced in 2001. While she is cast from the same mold as the first Dinah, this special edition was now painted with a red dress and darker hair. The special edition figure also identifies the sculptor Elio Simonetti as her creator. With our two Dinahs in mind, we started watching for other Fontanini figures that might compliment our collection. In August 2011, at Bronner's Christmas Wonderland in Frankenmuth, Mich., we found the music cart, also from the 5 inch village collection. 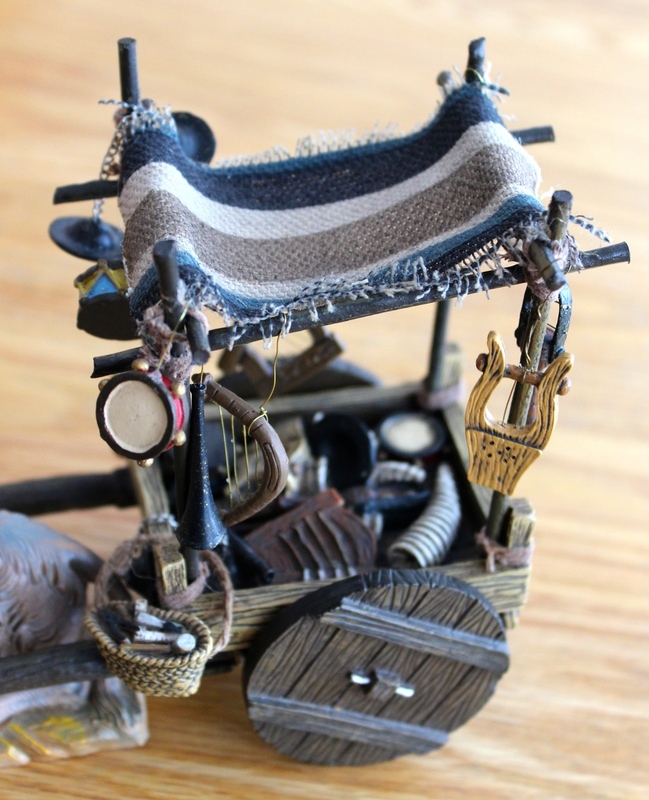 While there is no story card to go with it, it is a wonderfully detailed cart with nine traditional biblical musical instruments to attach to the frame. We were excited as one of the instruments was the frame drum, with a second molded into the body of the cart itself. The box for the music cart showed the cart being pulled by a white horse with a colourful Italian Renaissance looking harness, totally inappropriate to my eye for the cart. It was sold separately, and we were not interested. For some time, we simply left the cart with the two Dinahs on the shelf, but it always looked a bit incomplete. In time, we found a little Christmas store (now closed) outside of Merrickville. ON, which had a small selection of Fontanini figures. I always thought a donkey might be more appropriate for the cart than a horse, but the only donkey they had was reclining. It was then that it occurred to us that if the Dinahs were singing and dancing with their drums, the sensible donkey would not stand around, but take advantage of the opportunity to rest his weary feet! When Betty Lynn and I visit a large antique mall looking for drumming artifacts, we usually divide forces. By tradition, on entering, she goes to the left and I to the right and we each systematically cover our area until we meet somewhere towards the middle of the mall. This is what we did when we visited the Heart of Ohio Antique Center near Springfield, Ohio in April of 2013. 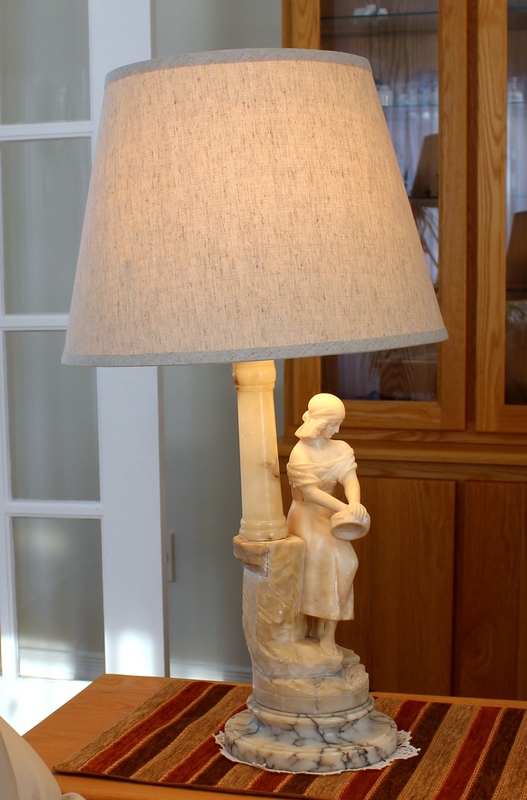 No sooner had I left Betty Lynn, and started into my section, then I spotted the lamp base, not in one of the endless rows of glass covered display cabinets, but rather sitting above one of those cabinets. I recognized at once that it was a real "find" and wondered what do I do now? Do I run after Betty Lynn, who could not have gotten far, or do I carry on, confident that it will be still there when we meet in an hour or so? I decided on the latter course of action, and covered my half of that enormous mall without finding another thing of interest. When I finally met up with Betty Lynn, she was very happy with her success in finding a few little figurines. She then asked about my luck while noting that I appeared empty handed. I suggested she follow me and led her back to the case very near the front of the store. She peered inside and then looked back at me as if to say, have you lost it? There's nothing here of interest to us. At that, I pointed upwards, and fully enjoyed hearing the gasp that meant I had hit the mother-lode. Once we had it lifted down and moved to the front desk, we had a chance to examine it more carefully, I noted that there were some condition issues, and steeled myself for the bargaining that would now ensue. The price being asked was on the high side, so I offered what I thought would be a fair price at about two-thirds of asking. As this was a mall, and everything was on consignment, the consignee had to be called. 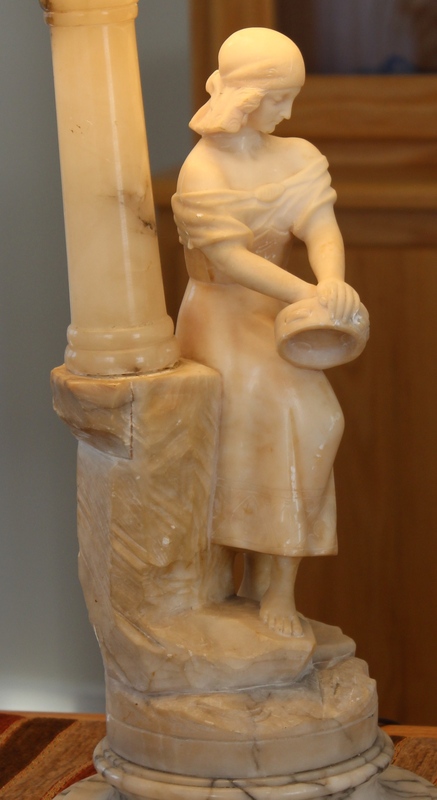 We were delighted when word came back that our offer was accepted and this beautiful alabaster drummer on her marble base was to be ours. She now takes pride of place in our living room and is the first thing visitors usually comment on. In May of 2013, we found a delightful little figurine in the Ontario Antique Mall at Farmington, NY. It was a cat standing erect, dressed in a colourful gypsy outfit complete with neckerchief and holding a tambourine with two paws in front. One description which I found of this figure online spoke of him holding a cap, but caps do not usually have gold coloured jingles through the brim. No, clearly, it represents a gypsy with his tambourine. But a strange figure, nevertheless, to my eyes. Clearly this was a cat with feline facial features and a long droopy tail, but it stood so terribly erect - almost at attention - with a plump torso that would have been better suited to a retired army colonel. A charming piece for our growing collection. 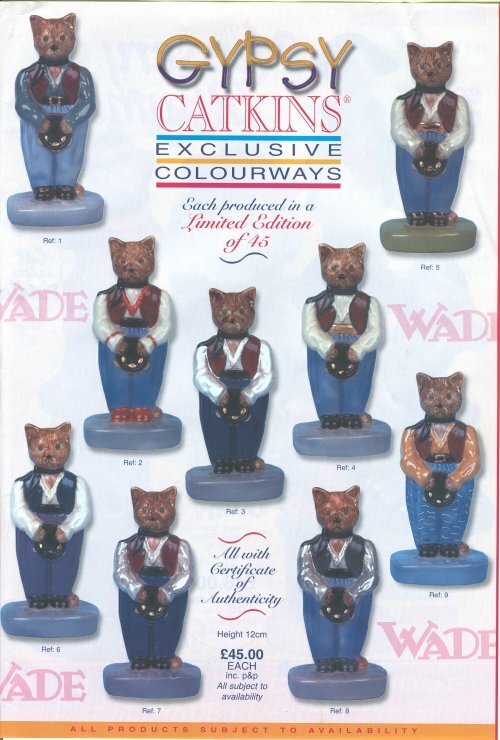 Online, I also discovered that UK International Ceramics commissioned Wade Ceramics to fashion a number of items for the Wade Trentham Fair between 1999 and 2001. Two of the pieces produced for the 2001 fair were the Gypsy Catkins and the Clown Catkins. Both of these pieces were limited to a run of 1000, but some of these limited numbers were also produced as a special colourway, using different colours from the original figures and carrying their own certificate of authenticity. There were 9 Gypsy and 9 Clown sub-sets of 45 each in in this limited number, and all of these were then sold in 2001 for 45 pounds apiece plus packing and postage. From the poster used to advertise the availability of this special colourway series, it would appear that our Gypsy Catkins is Ref. 1 in the top left corner of the poster. Our Certificate of Authenticity indicates that we have figure no. 36 out of the run of 45. When I visited Udiapur, Rajasthan, in October of 2008, I spent some time at the Royal Art School. 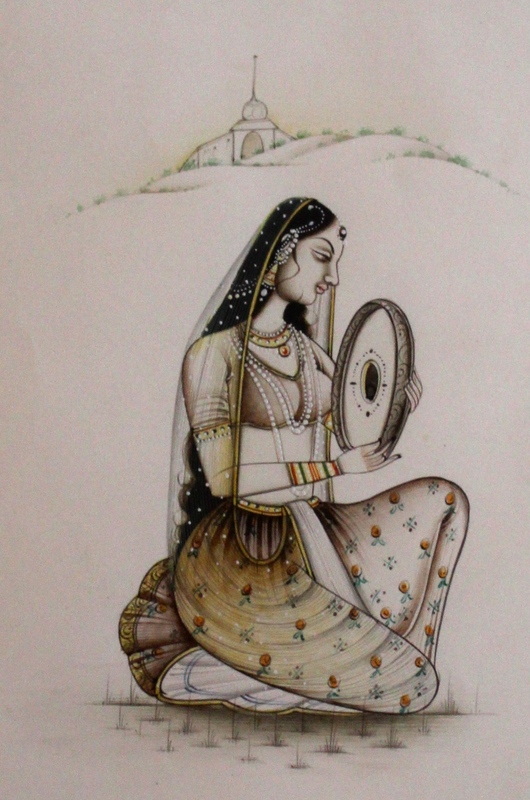 While browsing through their collection of paintings and drawings available for purchase, I found this delightful pen and ink drawing of a Rajasthani woman holding a dafli. Note the beautifully delicate quality of this painting, especially the drummer's sari and the many individual blades and clumps of grass typical of the area. The tomb in the background nicely links her drum with the thousands of other women drummers taking part in funerals for their families and friends. Their drumming helped insure the resurrection of the deceased. This use of the Biblical drum was one of the last bastions of the women's resistance to the earliest church fathers who did not know why drumming and death were so intimately entwined. Yes, these were theological differences between Christianity and earlier practices. But the peoples' hearts trumped the church fathers' thinking for many centuries. Drumming at funerals still occurs in small villages in Spain and perhaps elsewhere in the Middle East. The details on the skin of her drum are equally noteworthy. They are also very ancient and authentic within the the Biblical drum's long history. The large circle represents the oomphalos or earth's navel,the source of origin and issue of all things created - a most hallowed location in many religious sites, and thus a natural place of pilgrimage for deeply heartfelt prayers of thanksgiving, adoration, supplication and intercession. The circle around the oomphalos portrays, evokes, and reminds the drummer of the One amid the many, the Unity and its accompanying multiplicity through the process of self-revelation and creation. The circle also brings to mind all the other interlocking polarities of the divine and the common in Christianity and other religions. Most likely the oomphalos and the circle around it would be painted in red, the colour of blood, symbolizing both menstruation, the bleeding that does not bring death, and the blood that flows at birth as it brings into being the miracle of new life. The drummers posture reflects her humility before such amazing realities. I apologize for having left this roadie's blog for a few months, but the acquisition of two new puppies in October completely distracted me for a while. Now I intend to get back to it again and continue this blog for all those who may be interested in how the frame drum is depicted in art. As a beginning, I have updated my piece on Transferware (July 20, 2013) to mention another charger with a transfer painted in the same style as the centrepiece which is featured in that posting. 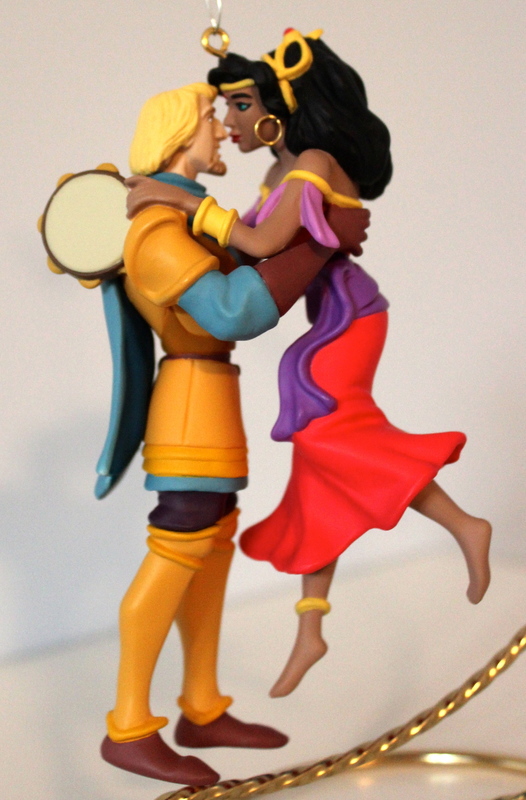 I found a Hallmark Keepsake Ornament of Esmeralda and her dancing goat Djali sculpted by Ken Crow and based on Disney animation characters from Victor Hugo's The Hunchback of Notre Dame in the Salamanca Antiques Mall in Salamanca, NY, in October 2012. We picked up the companion ornament showing Esmeralda and Phoebus in the Springfield Antique Center in Spingfield, OH, in April 2013. Finding these two figures piqued my interest and I started reading a bit about this Disney animated feature which I have never seen. Imagine my surprise to discover that Disney Studios had taken that dark story of unreciprocated love and turned it into a tale where Phoebus and Esmeralda live happily ever after, and even Quasimodo, the Hunchback himself, achieves a measure social acceptability. Oh the places that frame drums take us! I have posted updates on two of my earlier blogs. The first is called "Majolica Centrepiece (Updated)". It was originally posted on May 24th of this year. The second has been re-written to reflect additional information sent to me by e-mail. It is now titled "German or Bohemian Majolica?" and was first posted on May 26th of this year. To find these updates, please scroll down the blog to the dates mentioned above. In my wanderings through the antique shops and malls of Northeastern United States, I was always struck by the quantity of Fiestaware on display. As I was only interested in frame drummers, I usually walked by these displays without a glance. That is until April of 2013 when I passed a large display of Fiestaware in the Mad Hatter Antique Mall in Adamstown, PA, where, front and center in the display was a 12" high resin Spanish dancer in a cobalt blue gown shaking her tambourine. My first thought, on seeing her, was that someone had added her to the Fiestaware display to add a little extra pizazz, but on closer examination the Fiesta logo and copyright sign were right there on her red pedestal. It turns out that The Homer Laughlin China Co. uses this dancing lady as the symbol for their Fiestaware line and my discovery may have been used for store displays. The dancing lady was not actually made by Homer Laughlin but was manufactured under license. However we were subsequently able to purchase a couple of genuine Fiestaware pieces with the dancing lady symbol: a plate and a Christmas tree ornament for 2009. The Canadian Aboriginal hand drum consists of a wooden frame (often ash) which is covered with a deer, moose, or bear skin which in turn is tightened with raw hide lacing at the back. Unlike the frame drums of the Middle Eastern and European cultures, this hand drum is usually played not with the open hand but with a beating stick. And yet, in our search for frame drum playing artifacts we came across two delightful Aboriginal figurines in resin, each playing their drum in the European fashion. The first is a a beautiful Aboriginal girl in a buckskin dress with flowing hair who is holding up her drum close to her face. She stands about 5 and a half inches tall and goes by the name "Red Star." Betty Lynn found this in a shop in Kentucky in 2011. The second is even more unique. She is a hanging figure which I found in a "Christmas is ... Everyday" shop in Waynesville, North Carolina also in 2011. 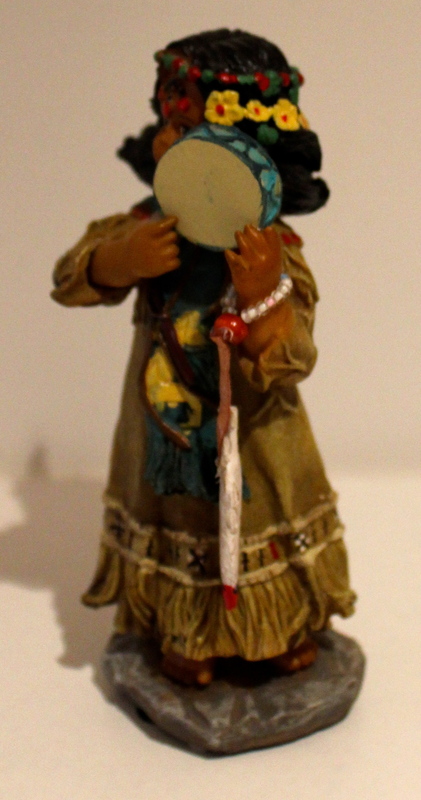 Like the first figurine, she is clearly Aboriginal and dressed in a buckskin dress. In contrast to the first, however, she is playing left handed and she has beautiful wings! Indeed, on the bill of sale, she is described as an "Indian fairy." This delicate little person is only 4 and a half inches tall. On the same trip to India where I found the traditional Rajasthani painted wooden dafli player, I also came across a magnificent three and a half foot high solid silver image of a dafli player in a traditional Rajasthani tribal style. It was, of all things, installed by the catering company as a decorative ornament in the reception tent at the safari camp set up for visitors to the annual Pushkar Camel Fair near Ajmer in Rajasthan. After this discovery, I kept my eyes open in every handicraft bazaar for a smaller version. Sure enough, in Jaipur, I found a seven inch high version of the same statue but now in white metal with a touch of silver leaf. My real surprise came back in Canada when I found two more tribal figurines in white metal playing the dafli in a shop in Little India on Gerrard Street in Toronto. These were eleven inches in height, so taller and more detailed than the one I found in Jaipur. I have not been able to find out much about these Rajasthani tribal figures except for the interesting fact that the little ornaments hanging from their bodies are called "ghungroos". A few years ago, while touring in India, I kept my eyes open for any artistic representations of musicians playing the dafli (frame drum). In Jodhpur, I found this figure in a larger group of musicians, playing her dafli with great delight. I love the way she raises her left leg and plays her drum while balanced on her right leg. I am given to understand that these traditional handicrafts are produced by whole families within a village cottage industry setting. The men of the family carve the figures out of a soft white wood and the women then hand paint each figure in the brightly coloured traditional Rajasthani style. My Dafli player stands eight inches high. I have posed her in front of a dafli which I purchased in Toronto in "Little India" on Gerrard Street. I have been keeping my eye out for a bronze clock topper with a figure holding a frame drum. So far, my luck has been limited, but in the Lancaster County Antique Center in Denver, PA, Betty Lynn spotted this clock topper in white metal with a bronze finish. It is not in great condition as the metal has deteriorated and there is a crack on the left shin. Still, until we find better, it has a place in our collection. In the same antiques mall in Brunswick, Maine, where I found the LeRat etching, I also found an inlaid wooden plaque on a brass easel depicting a couple dressed in traditional central European village costumes dancing while each was playing a frame drum. When I first spotted this unique piece in the Cabot Mill Antiques Mall, I recognized that it was made of wood, but I just assumed the figures were merely painted on it. It was only on careful examination did I come to realize that it was made up of a number of painted pieces which were then carefully inlaid into a two part wooden background. I have photographed one view of the plaque on an angle so that you can see the various inlaid pieces. Since writing the above, I have discovered that this object is correctly described as an "Intarsia Pictorial Panel". "Intarsia" is defined in the dictionary as: " A decorative inlaid pattern in a surface, especially a mosaic worked in wood." Intarsia is a German word from the Italian Intarsio. In York, Maine, I came across a little antiques store called Blanche's Antiques. Inside, I found it to have many religious objects including a number of reproductions based on Fra Angelica. I immediately assumed that I would have good luck here, but no, the proprietor insisted that while he had many angels, none to his knowledge were holding a frame drum. Being me, I insisted on giving the shop a good going over, and sure enough, right there in plain sight was a delightful 12 inch high cast iron putto that a long time ago probably graced someone's garden or patio. By the way, I noted on Blanche's business card that Michael and Paul were the only names listed, so I asked who Blanche was. It turns out that all the antique and gift shops in the area had women's names, so these guys decided that their shop would be Blanche's, just to fit in.